A collaboration between Rainforest Rescue International (RRI) and REM aimed to encourage good governance in the fisheries sector in Sri Lanka, with a special focus on tuna fisheries. This pilot project was designed to assess and develop the role of civil society. Over the 18 months of the project, RRI and REM worked together to build an independent monitoring model. Management – to improve consistency and coordination within selected areas of fisheries policy and law, including at the provincial level. IUU fishing in Sri Lankan waters – to help create a better monitor and report system on IUU fishing by foreign vessels in Sri Lankan Waters. IUU fishing outside Sri Lankan water – to better inform fishers of international obligations and support mechanisms of control. 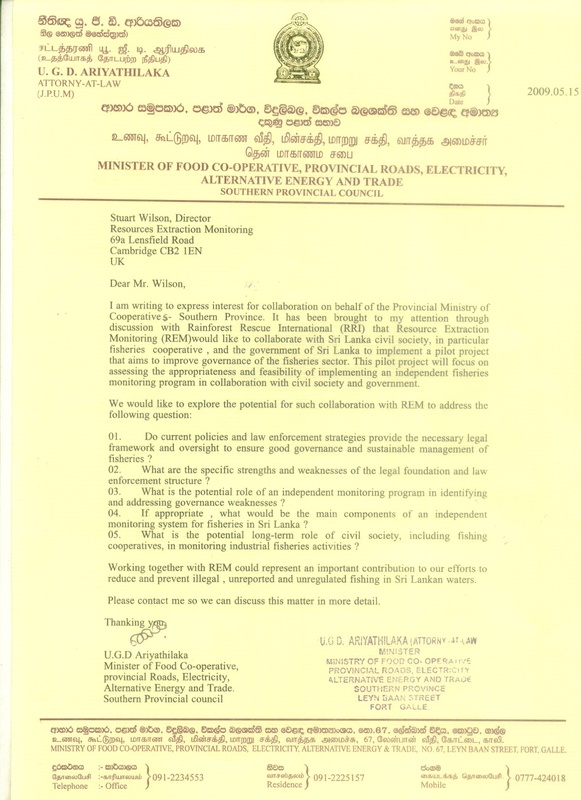 The Ministry of fisheries: information is forwarded to the Central Ministry via the provincial Ministry, informing it of the results of the reading committee meetings, highlighting enforcement actions that have been taken at the Provincial level by the administration and others. The rapporteur also communicates suggested enforcement and policy actions to the central government. Data generated by the monitoring operations can be used by research and management bodies such as NARA. The Fisheries cooperatives, coastal zone: awareness raising of the laws regulating coastal zone fishing and establishing systematic reporting mechanisms of fishing activity, including dynamite and moxi net fishing etc. Develop concepts of management and interactions between coastal and off shore fishing. Rainforest Rescue International : the role of RRI in the project was to create the project structure in country and take the lead in finding funding, bring the actors together and facilitate the process of project implementation. This included exploring further the potential to work with the Marine Stewardship Council and supporting organisations in Sri Lanka. Promoting best practice in the sector and supporting sustainable economic growth. © 2018 Resource Extraction Monitoring. All Rights Reserved.